With 25 sections, this stylish vanilla coloured stacker jewellery box is designed to hold several different types of jewellery, perfect for your charm collection or earring collection. 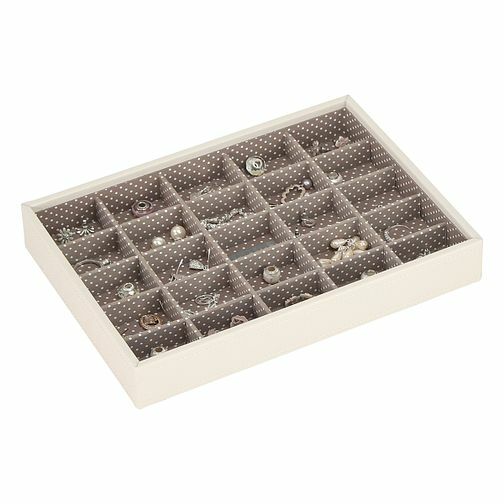 The perfect way to build layers to create your own unique jewellery storage solution. Stackers Vanilla 25 Section Stacker Box is rated 5.0 out of 5 by 2. Rated 5 out of 5 by Anonymous from Elegant and charming Beautiful and charming jewelry display. Elegant for display or in a drawer, showcasing your items in a soft and luxurious cushioned tray. Bought as a gift and wish they sold these overseas at this price!